Hello again crew. Seems like I've been writing you guys a lot lately. This will hopefully be my last question for a while! I ordered a Powder Blue Tang online. When he arrived he was very thin but he was eating right away. He was even searching for food in the acclimation bucket! He has not come down with crypt and eats voraciously on Nori and Rod's Food soaked in Selcon. But as stated he is very thin. I am just wondering if there is anything more that I should be doing for him? Other than supplying him with an endless amount of Nori. I have attached a few pictures for reference. Thanks Bob. Sorry about the image sizes. I can resend with smaller sizes if you would like. I have various sizes of NL Spectrum Pellets that I can offer. Should I be soaking them in the Selcon solution? I am appalled in the condition that this fish showed up in. This is the second tang that showed up like this. First one was a Naso that died 4 days after arriving. I could not get that one to eat. Needless to say I will not be ordering from that company in the future. Powder Blue Tang for the past 8 weeks in my 180 gallon FOWLR. 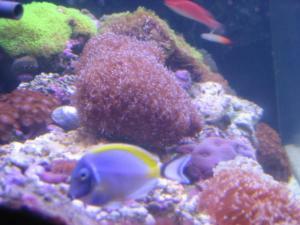 The tang eats well, on a diet of Spirulina brine shrimp, mussel meat, formula 1, and daily Nori sheets. His stomach is not pinched in (indeed he has a little belly on him) and he is not thin behind the eyes (per your article) but I can see his spinal column quite easily, especially on the anterior half of the fish. The tang is quite active and behaves normally, but should I be worried about this? <Mmm, no. I'd use Spectrum pelleted as a basic/staple... a few times daily. 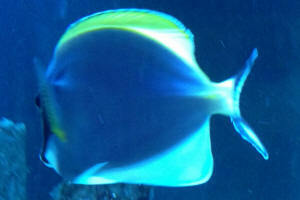 I know tangs have laterally compressed bodies, but I wondered if this was normal. 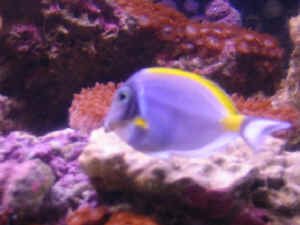 I have a powder blue tang in a 180 gallon tank that stopped eating and swims at the bottom of the tank like he cannot see. He is bumping into the glass tank and the rocks. He is not very active at all. Water and tank quality is the same and no changes. I am not sure what to do. He does not have any signs of disease on the outside. I checked the body and eyes and they appear clear. I do not know what to do. We have had the Tang for about 9 years now and do not want to lose him. Please help. Thanks Bob. I will search the site as suggested but I am very concern that he is not eating. How do I get him to eat? First off, let me just say that your web site has been such a help with both the setting up of my freshwater tank and now my new reef tank. 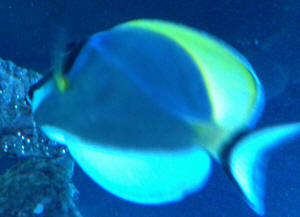 Yesterday, I went to my LFS and bought a Powder blue tang semi- impulsively. ( I knew a lot about tangs and knew my 120 gallon fish tank could support it, but I got home and read that they need an older aquarium.) I tried to return it to the fish store but they would not take it back because it would be too stressful for the fish understandably. My tank was cycled with 50lbs of live rock for 2 to 3 weeks. My question is what is and what are the signs of the white stress bar and does he have a chance that he will live. I feed him algae, brine shrimp and New life spectrum optimum salt H20 with garlic in them. He looked very healthy in the store. ( he is the right colored blue, clear eyes, responsive, active, and eating already.) The only thing I saw wrong was one dark splotch on him but it is already half gone. I put him directly in my main tank because it was empty and am currently putting stress zyme in that replaces his mucous coat and treating him precautionarily with reef safe kick Ick.